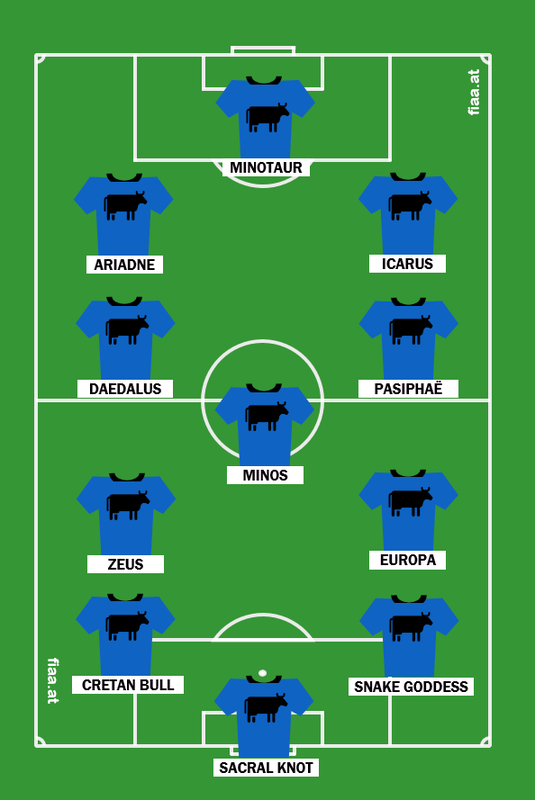 The Minoan civilisation dominated Mediterranean football for centuries, but perhaps its greatest team was the Real Minoa squad of the Neopalatial era. Little was known about them until Arthur Evans, a British football journalist and ex-pro for Oxford United, published “Squadra Minoa” in 1909. Real Minoa’s dominance was based on possession football, the team content to trade passes in their traditional “figure of eight” shield formation until an opening presented itself. This Pax Minoica playing style might be considered the forerunner to today’s tiki taka. The core formation centred on King Minos in the number 6 role (the Minoan numbering system was unsuited to display on shirts, so referees had to go by sight and shirt name only). Behind Minos was the Zeus – Europa partnership. Zeus, of course, better known by his nickname “The Card Collector”: his tendency to turn into a swan or shower of gold if he spotted a good-looking nymph in the crowd led to numerous conflicts with referees, most famously Hera at the Olympian Invitational Trophy. Daedalus was very much the creative engine of the team. There were high hopes for his son, too, but Icarus never really fulfilled his potential thanks to a tendency to stray too far out on the wing. Nevertheless, he was one of a number of players to come out of the excellent youth system, with Minoan midfield artistry a ubiquitous presence throughout the Aegean Premier League and Egypt’s Pyramid One. The defence was the only true weak spot, largely due to internal disputes. The Cretan bull had to be kept separate from Pasiphae after an unpleasant incident the last time they were paired in the field. And conflicting religious and mythological ideologies meant the Sacral Knot and the Snake Goddess had problems integrating with the rest of the team. The team’s playing style was by no means one-dimensional. If necessary, they could switch to a double-headed axe formation when counterattacking, feeding balls quickly to their bullish striker, the Minotaur. He was famous for scoring in every home game but one. In a legendary qualification match for the Dionysus Cup, visitors FC Athens won 1-0 thanks to a stunning performance by their young goalkeeper, Theseus. It was the same player, of course, who then tapped up Ariadne for a potential transfer to the mainland. They were spotted at a coffee shop in Naxos, forcing Theseus to withdraw from the deal. Real Minoa’s otherwise outstanding home record at the Knossos Arena was, however, not without controversy. Visiting players often complained of difficulties finding the dressing room and pitch, eventually forcing UEFA to provide away teams with a ball of string. Others questioned the legitimacy of the team’s success, given its reliance on myths and religious symbolism that left local historical figures on the bench. However, this was not unusual for teams of the time (see, also, Olympusolympiakos and Pantheonaikos). Today, football scholars still debate the reasons for the eventual decline of the team. Most believe the Minoans failed to adapt fast enough to the more aggressive styles of the new Mycenaean clubs that went on to dominate Aegean football until the arrival of the Greek Dark Ages.